„Convenient at advent times, where many wickets open, we as well open our doors! If you ever wanted to know what’s happening in the historical buildings on RAW you are heartily invited to drop by and find out! The four buildings of the historic ensemble are housing manifold sociocultural activitites. Beamtenwohnhaus (BWH) and Verwaltungsgebäude (VWG) focus on fine and performing arts. 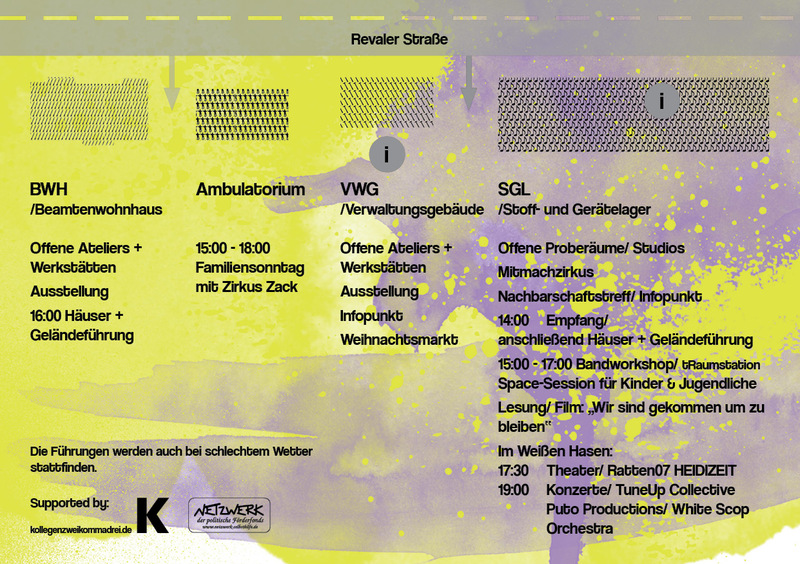 Ambulatorium as theatre/event space and Stoff – und Gerätlager (SGL) offer space and studios for circus training and musical projects applying to all generations. Together they form an open and lively sociocultural center. Here you can experience artistic production as well as the democratic self organsiation of social commitment. The historic buildings are living history of the quarter and an inspiring environment for resident artists and guests.